Underwater adventures in photography really took off when the original GoPro camera launched in 2002. Their cameras are built to withstand depths of at least 131 feet. The average underwater photographer may not ever travel that deep, but it’s cool knowing the possibilities. Taking underwater pictures is a whole new world. A lot of photography skills don’t translate the same when surrounded by water. Light plays differently, your foundation is replaced with floating, and focus is shifting. To help you get your feet wet, we’ve put together this short guide. It will help you prepare, refine, and perfect your underwater skills. Let’s jump in! Shooting underwater on a budget is difficult. This is especially true if you’re traveling on a budget. 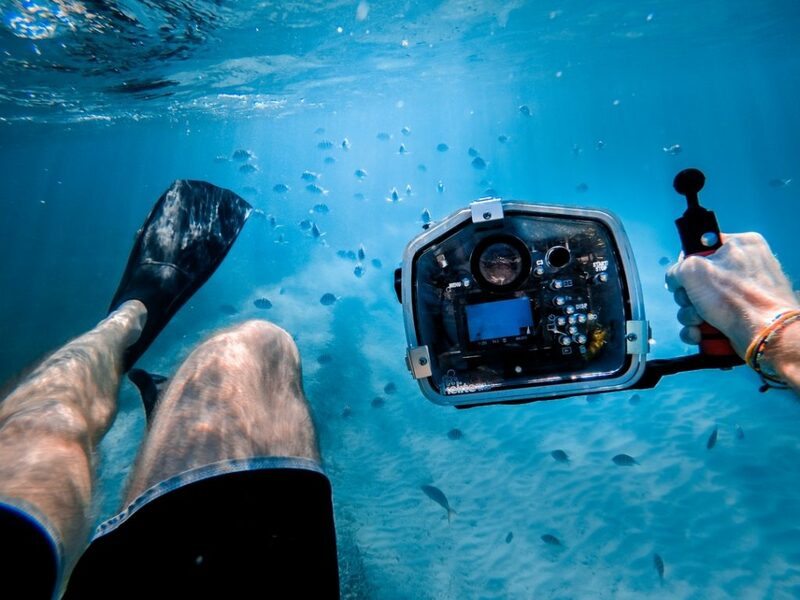 You have to have either a GoPro or proper underwater housing for your camera. Housing is going to depend on your model camera, but they can rival the price of the camera itself. Housing will require a lens port, which will come in a bunch of sizes and either flat or domed. Flat is for macro shots, while dome is for wide angle. Water alone will decrease your angle by a quarter of a lens’ capability. There’s a lot more more about flat and curved lenses to learn, which we recommend reading later. Jumping in a body of water with a camera is not for the faint of heart. You will be tested physically and mentally by the elements. Even a clear day, you will need to make adjustments on the fly. Here are just a few examples. For those that spend very little time in the water, the clearest water is found in calm bodies of salt water. Freshwater needs to be running to get the best clarity, which introduces other problems, of course. Swimming pools also rank below calm salt water. It can be really difficult to focus underwater when you have free-floating particles. Unfortunately, you can’t really discern the water quality until you start taking pictures. One of the most important keys to getting consistent results underwater is a steady anchor point. If you can’t stand still to take photos or avoid kicking up dirt/sand, you’re going to have a lonnnng day. Sandy sea floors are ideal because 1) they’re easier to walk on and 2) they reflect more light than other surfaces. If you’re planning on venturing out into the ocean with your camera, be aware of potential dangers. From the excruciating pain of a jellyfish or stingray to the annoying sea urchins and aggressive sharks. Also, make note of any surrounding coral. Disturbing coral reefs can result in a hefty fine. Getting the most natural light possible is hard to do underwater, even if it’s a clear day. You want to aim for high-noon when the sun is directly above. The sun’s rays go the deepest when it’s straight down. The positioning of the subject and the sun is also going to be important. You have to think about the background, shadows being cast, and the sun’s glare. Do all your camera assembly before you arrive. Make sure your camera housing is tight and secure. Do this in a well-lit room, not your car. If you’re an experienced photographer who is used to cramming a tight schedule, make an exception. Check your o-rings, the lubrication, clean the port and your lens. One mistake could destroy your equipment and there’s no warranty out there that will cover your own negligence. Try stuffing some desiccant pads into the housing. This will keep your lens from fogging up. Usually, one on each side of the camera is enough to do the job. Double-check your camera’s lens cap, memory card, and battery. Take your time doing all of these obvious checks to avoid wasting time drying, opening, and resealing. There’s no perfect setting for shooting underwater. You can start your aperture size at f8 to compensate for the blurry environment. This is especially true for over/under scenes. Keep your shutter speed over 1/200s, unless both you and your subject are grounded and the water is very still. Get used to using burst mode, too, even still shots can have an unusual amount of variance. If your camera has additional focus settings, like Continuous-Servo or AI Servo, use them underwater. They’ll help you get great shots of aquatic life. If your shoots will deal mainly with stationary poses, switch to Single-Servo mode. If you hold the shutter button down halfway, you can also get tracking focus on-the-fly. This makes it much easier to swap between settings if you can’t access manual focus controls underwater. We recommend an ISO of 100 or 200 to keep things as clean as possible. Oh, and always shoot in raw, in case you were wondering. Colors and filters are always going to look a bit off underwater, so you should expect to be doing a lot of manual tweaking in Photoshop. Ready to Conquer the Waters? We hope this guide has provided some level of confidence for those wanting to try underwater pictures for the first time. As you can see, a great underwater camera is important, but there’s a lot of stuff to account for, too. Bringing stuff to keep everyone cool and comfortable definitely helps, too. Before jumping into big bodies of water or places with fast currents, practice swimming there. Get used to swimming and diving for long periods. Buy a good snorkel that won’t fog up or hurt to wear. Being aware of your surroundings is also a priority, so familiarize yourself with the location. You wouldn’t want to be zoned-in on your subject and float into a sharp rock or far enough to introduce water into your lungs. Once you get a knack for underwater photography, you should start planning for exotic locations. Check out Beek Man Beer Garden’s adventure sports posts for inspiration.